Jared Loughner has stopped smirking while listening to court proceedings over whether he can stand trial for murdering six people and wounding 13 during an Arizona shooting spree. Based on this and various other signs that his mental health is improving, yesterday a judge ruled that he should continue receiving treatment in a federal prison for at least four months, clearing the way for Loughner's case to eventually go to trial. In May Loughner was diagnosed with schizophrenia and declared mentally unfit to stand trial. He's being held at a psychiatric facility in Missouri, and for the past few months, Loughner's lawyers have been arguing with prosecutors over whether or not he should be forcibly medicated. Last month a judge allowed the medication to continue, and now his doctors say he's shown noticeable improvements. In the past, Loughner insisted that he killed Rep. Gabrielle Giffords in the attack even when he was shown proof that she survived, according to the Wall Street Journal. Now his psychologist, Christina Pietz, says, "He understands he's murdered people ... He feels guilty." Loughner is still on suicide watch, but with anti-psychotic drugs he's stopped responding to hallucinations. Two months ago he attacked his lawyer and prison employees, removed his clothes in front of female workers, and spread feces on his bed. Recently he's been maintaining eye contact and having short conversations, and was able to talk about his pet dogs and turtles when shown pictures. Pietz says the "inappropriate affect" Loughner showed in his disturbing mug shot is gone, and the judge noted in court yesterday, "his demeanor is distinctly different ... His smirk is gone. He appears to be paying attention." 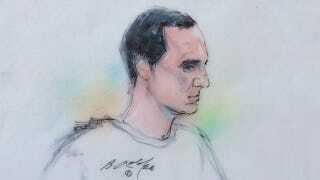 Loughner had a flat expression in court yesterday even as doctors described his psychotic episodes. Though he probably didn't know it, he was also looking at several of the victims of the shooting. The courtroom was filled with survivors of the attack and their families, who seem to have grown close. Loughner's attorneys argued that his lack of expression meant he wasn't making as much progress as his doctors claimed. However, psychiatrist Dr. James C. Ballenger insisted that even Loughner says the medication is helping him. Loughner has told his doctors he wishes he'd started taking anti-psychotic medication sooner, and believes the attack might not have happened if he had.